For me, this year has held many trials and tribulations. It was a great year for learning, sharing, reconnecting and reflection. I will always look back at this year as a year that defined me. 2010 was a year of substantial losses and gains that I never thought unimaginable; the birth of a son and the loss of my best friend. As I look back at my cave diving and exploration this year, I can think of a few cave dives I was involved with in 2010 that I reflect fondly upon and have made a profound impact on me. As I dropped 130’ into a room over 300’ in diameter and 100’ tall, I was awe struck! Such an amazing and foreboding place; this cave ate light like no other cave I have experienced. As I slowly rappelled into the abyss, my eyes strained to make out the distant walls of a cavern that the local inhabitants had no idea just how expansive it really was. In so many of the caves we explore, we are often times the first to discover them as well. However, the seven skulls we found in this cave reminded me that I was not the first. It was difficult to imagine how they came to call this cave their final resting place – so many options. Were they slaves simply tossed into the cavernous depths as mere chattel, were they sacrificed by the Maya eager to appease the gods of rain, or simply victims of being the town drunk taking the wrong step at the wrong time. I hold all of them in reverence and have been honored to share their amazing find. Here we discovered and recovered the most intact New World primate ever found – Antillothrix Bernisis. The journey of finding this primate and recovering it has been filled with new friends and challenging situations. I will be forever indebted to Dr. Alfie Rosenberger for his drive, desire and willingness to teach me. He has made me a better and more thoughtful explorer. I am proud we made the right choice to find the right person to handle these primate fossils. My thought is that this expedition, these cave dives, this project, will open up the world of underwater primate paleontology and create a unique cohesion between cave divers and the world of academia. 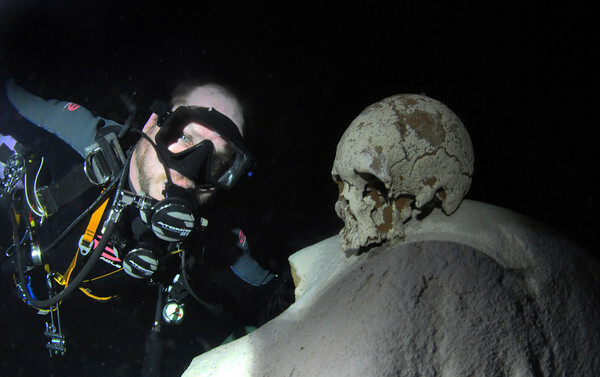 Using UV lighting underwater to fluoresce bones and teeth was a known first in underwater archeology. It is so rewarding to know that I was there and the world has more knowledge because of it! This dive, serving as the beginning of my much needed catharsis, taught me volumes about preparation, training, gear and just how much a dive partner affects the dive (both positively and negatively). I wrote a pretty substantial article about this (The Cathartic Cave Diver) and won’t dwell much on it here. Read it, I hope it helps you understand the mindset of the “solo cave diver” better. I was once told that if I survive my life on this Earth with more friends than I can count on one hand I would be a very blessed man. I know I am blessed: blessed with astonishing friends, a loving family, a career and endless opportunity. I give thanks for this daily but not nearly as much as I should. 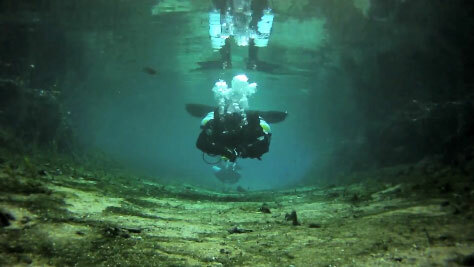 However, in the darkest of my days my dear friends decided we should just go piddle around in Manatee as a good last cave dive to the year that will some become the past. It wasn’t the dive that was most impactful, it was simply the caring side of friends that put others well ahead of themselves. But, any cave dive is better than a day not exploring our amazing planet! A nice swim from Catfish to Friedman’s will do any soul good – and burn a few calories. I hope everyone has had as great a year as I did exploring this beautiful blue marble we call Earth. I am currently gearing up for a return trip to the Yucatan jungle next month and several more exciting cave diving expeditions we have planned for 2011. As always, if you think of something I can do to make Cave Atlas better, please let me know!